This tutorial video is designed to help new and incoming organic chemistry students build a solid foundation for organic chemistry. This video has additional examples of finding the electron configuration of larger atoms and the shortcut version using the noble gas kernel. 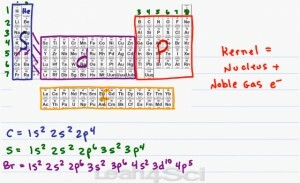 Video 4 (Electron Configuration Part 1) showed the introduction. This is Video 5 in the Intro to Orgo Video Series. Click HERE for the entire series. I know carbon has 6 electrons, how come it looks like he has 8 electrons when you write its electron configuration? 1s2-2s2-2p4? Thanks. The correct answer is 1s^2 2s^2 2p^2. Thanks for catching that error. is it possible to write Noble gas configurations in an excited state? And how would you write normal excited state electron configurations? I’m confused with noble gas configuration of Carbon..?? Ok, I understand that. But why is the electron configuration for carbon 1s2 2s2 2s4, instead of 1s2 2s2 2p2. Wouldn’t thwt make [He] 2s2 2p2 ? Why didn’t you include the d orbital in the shortcut for the electron configuration?